Mr. Savvy was watching the movie The Coneheads on t.v. the other day and it reminded me of how much I liked that one especially the first time I saw it. I love movies that make me laugh. Here are some of my favorite comedies. French Kiss with Meg Ryan and Kevin Kline. I have watched this one so many times and still love it. Love Meg, too. 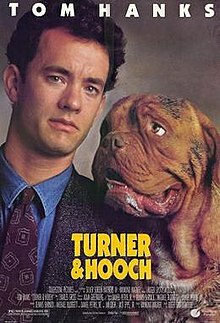 When we went to see Turner & Hooch, I swear I was about the only one laughing out loud in the theatre. I hurt I laughed so hard. When Hooch ate the inside of Tom's car in the movie I could not stop laughing. But my favorite gut busting laughing till I cry movie has to be The Money Pit. I still laugh at it as if it was the first time. I think it is because we are DIY'ers to save money and we built our house doing much of the work ourselves almost seventeen years ago and we stayed married! Those are some of my favorite comedies. Now go grab an old movie and some popcorn tonight and enjoy or go to a new one in a nice cool air conditioned theater and enjoy their popcorn. These are all funny especially the money pit.I remember seeing that the first time and I did not think it was funny at all.Because I was just a kid no home I did not get it.Until I watched it later and really got it.I love the cone heads too! One of my favorites is Dumb and Dumber.Also even though it is Christmas movie I can watch it any time and laugh out loud the move Elf with Will Ferrell.Something about Mary is funny too. My favorite anytime get in a good mood movie, even in July, is Ernest Saves Christmas! (You know what I mean?) But last summer, when it was so hot outside, I started craving Dr. Zhivago for all the snow and ice scenes. But we will definitely put Coneheads on the list for Netflex. I still laugh at Chevy Chase's Griswold family! An old classic is Peter Sellers in The Party - and John Candy in Uncle Buck. 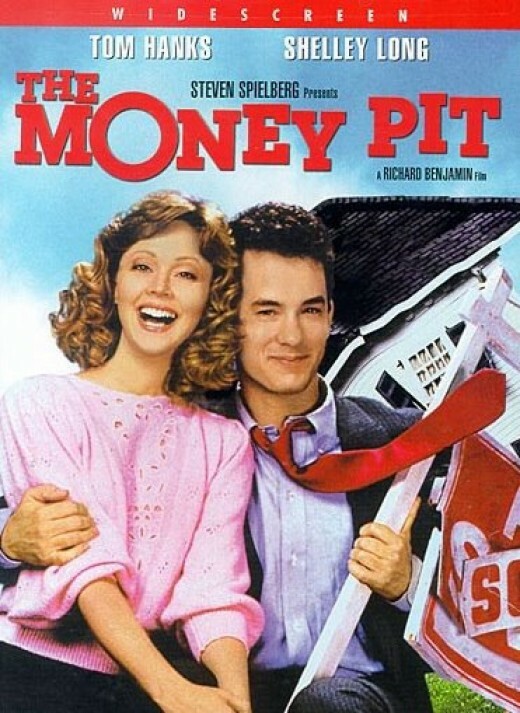 Love the Money Pit, especially when Hanks is in the floor singing the Name Game. If you liked the Money Pit I highly reccomend Mr. Blanding Builds his Dream House. Classic Cary Grant. The best line is the movie is "how do kids just starting out who aren't making 15K ever hope to buy a house of their own?" i think you have a great list and through the comments i'm reminded of a few more, Uncle Buck and Chevy Chase are so good too! Oh it is hot! Luckily the storm that came through last night did not knock out our power sadly there are many others in my state without. Crazy weather! I hope you are enjoying one of the movies above and relaxing! Stay cool! Love the money pit... and it is so true! lol!! One of my favorite crazy comedies is What About Bob~ if you haven't seen that one- you should rent it. :) Hope you are having a great weekend! I would take French Kiss with me if I was banished to some desert island. Tom Hanks is my favorite actor so most of his movies would be on the list too. All of Meg Ryan. My you have good taste! One of my favorite things to do...movies and staying home with the hubby! I have loved all of Meg Ryan's early movies. She was so much cuter before her "surgery". We are not big on tv or movies. I couldn't tell you the last time we've gone to a movie! When we do watch them, I like a good tear-jerker or a mystery/suspense (not horror!) - something that keeps me on the edge of my seat. All oldies but goodies. I'll never forget when the tub fell through the floor in The Money Pit! I'm not a good theater goer 'cause I like to make comments "out loud". Laugh a lot and ask questions. I know, ridiculous. the funniest rolling on the floor scene was in the original Ghostbusters when the giant Marshmellow Man came down 5th Avenue. still funny after all these years! It's funny you mentioned the Conehead movie because I have been calling Rosie a Conehead ever since she got her big cone on at the vet! I love all the movies you mentioned! I also love An American President, Ferris Bueller's Day Off, Honeymoon in Vegas and Only You. Whenever I catch any of those movies on TV, I will sit and watch them through to the end. I don't even know how many times I have seen them! - Oh and also When Harry Met Sally! LOVE that movie! I know it seems hard to believe, but I've never watched Coneheads. I'll give it a try. French Kiss is probably my favorite romantic comedy, but I love most all of Meg Ryan's movies. Men in Black is one of the few movies I've watched over and over, love Will Smith. Young Frankenstein is an old Mel Brooks spoof that still makes me laugh. I know, right? Why else watch a movie, if its not going put you in a good place? J'adore (just faking the french…don't know if even used it properly) FRENCH KISS, and my obvious favourite is MOONSTRUCK!!! The cone heads were my favorite. Gosh, How I laughed! Hope you guys are staying cool inside there. It is horrid here! Hope you consume mass quantities. If we're talking Meg Ryan, you can't beat When Harry Met Sally! Hi Kim, I love "Trains, Planes and Automobiles", and "Dumb and Dumber"! I laugh so hard, even after seeing them 2 or three times. Laughter is so good for us. We tried to go to the movies this weekend and the selection is really pathetic! Roll out the Netflix! Oh without a doubt one of my all-time fav movies is French Kiss- I own it and watch it all the time too. The first time I watched it I thought I would DIE laughing when Meg knocked over that pastery cart - I am not usually one for slapstick but she is so danged cute in that movie.........and I also went out back then and bought the soundtrack, I love it! some more funny favs: Tommy Boy, Something About Mary, So I Married an Axe Murderer, European Vacation (with the Griswalds) - gosh there's so many, but those are a few I just adore. Oh boy, you have brought back some memories ..and of the old SNL's. French Kiss is one of my favorites of all time, too. Meg is just adorable and Kevin Kline a hunk in a wierd way in that movie. I love Liar Liar and Pet Detective (a huge JC fan here!). What a great post--I love classic movies, and so one of my favorites is Tony Curtis (gorgeous!) and Jack Lemmon in Some Like It Hot. It's a beautiful script and the acting is fantastic--love it! My all time favorite movie is How To Lose A Guy in 10 Days. I just love it! OMG The Money Pit - I can still laugh like the first time - the turkey?